Ælfric’s Preface to Genesis (London, BL, Cotton Claudius B.iv, fol. 1r), courtesy of the British Library. Some time back, I noticed that quite a few people who came across my Academia.edu profile found it because they were searching for a translation of Ælfric of Eynsham‘s Preface to Genesis (about which I’ve written an article in English Studies). I did some searching of my own, and found that there are not many translations of the preface–one by Jonathan Wilcox in 1994, another by Burton Raffel in 1998–and none is accessible online. Unlike other Old English texts, and especially the poetry, Ælfric’s writings about the Bible do not receive much attention, though they should for a number of reasons. From a perspective of the literary history of the Bible in English, the abbot has quite a lot to offer. Here begins the Preface to Genesis in English. Ælfric the monk humbly greets Æthelward the ealdorman. You asked me, friend, that I should translate the book of Genesis from Latin into English for you. It seemed troublesome to me to give this to you then, and you said then that I need not translate any more of the book except up to Isaac, the son of Abraham, because someone else had translated the book from Isaac until the end. Now it seems to me, friend, that the work [of translation] is very dangerous to me or anyone to undertake, because I fear that if someone foolish reads this book, or hears it read, that someone might wish to think that one might live now under the new law just as the old fathers lived, when in the time before the old law was established, or just as people lived under the law of Moses. I once knew that a certain priest, who was my teacher at the time, had the book of Genesis, and he could understand Latin in part. Then he said about the patriarch Jacob that he had four wives: two sisters and their two handmaids. He spoke very truly, but he did not know, nor did I yet, how much difference there is between the old law and the new. In the beginning of this world, a brother took his sister as wife, and sometimes a father also had a child by his own daughter, and many men also had more wives for the people. And then at the beginning a man could not take a wife, except for among his relatives. If anyone wishes to live now, after the coming of Christ, just as people lived before the law of Moses, or under the law of Moses, that one is not a Christian, nor even deserving that any Christian might eat with him. For unlearned priests, if they understand only a little of Latin books, then it seems to them that they might quickly be great teachers, although they do not know the spiritual meaning of them, and how the old law was a sign of things to come, or how the New Testament, after the incarnation of Christ, was the fulfillment of all of the things which the Old Testament signaled toward, about Christ and about his chosen. They also often talk about Peter, why they might not have a wife, just as the blessed apostle Peter had. And they desire not to hear nor to know that the blessed Peter lived after the law of Moses, until Christ, who in that time came to humankind, began to preach his holy gospel and chose Peter as the first to follow him. Then Peter abandoned his wife right away, and all of the twelve apostles, who had wives, abandoned both wives and their possessions and followed the teaching of Christ to the new law and the purity that he himself upheld. Priests are established as teachers of lay-people. Now it is suitable for them that they know how to understand the old law spiritually and what Christ himself, and his apostles, taught in the New Testament, so that they might direct the people to belief in God and set a good example by good works. We also said before that the book is very profoundly spiritual in understanding and we will write no more than the naked narrative. Then it seems to the unlearned that all that meaning is locked up in the simple narrative, but it is very far from it. The book is named Genesis, that is “the book of species,” because it is the first book and speaks about each species. But it says nothing about the creation of the angels. It begins thus: “In the beginning God created heaven and earth.” That is in English, “In the beginning God shaped heaven and earth.” It was truly done so, that almighty God made creation in the beginning, then when he desired. But even so, according to the spiritual meaning, that meaning is Christ, just as he himself said to the Jews: “I say to you, I am the beginning.” Through this beginning God the Father made heaven and earth, because he shaped all of creation through his Son, who was always born from him, wisdom of the wise Father. Again the three angels came to Abraham and he spoke to them all three just as to one. How did the blood of Abel call out to God, except just as the misdeeds of each one accuse him without words? By these little things, people may understand how deep the book is in spiritual meaning, although it is written with clear words. Again Joseph, who was sold into the land of Egypt, and he saved that people against the great famine, had signified Christ, who was sold for us to death and saved us from the eternal famine of the torment in hell. That great tabernacle that Moses made in the desert with wonderful skill, just as God himself ordered, had signified the church of God, which he himself established through his apostles with many adornments and pleasing customs. To the building the people brought gold and silver and valuable gemstones and many ornaments. Some also brought goat’s hair, just as God commanded. That gold signified our belief and our good intentions that we should offer to God. That silver signified the speech of God and the holy teachings that we should have for the works of God. The gemstones signified the great beauty of the man of God. That goat’s hair signifies the hard penance that men repent for their sins. Men also offered cattle of many kinds as offerings within the tabernacle. By that is very much signified, and it was commanded that the tail should always be whole on the beast at the offering, which signifies that God desires that we always do well until the end of our lives; then the tail is offered in our works. Now is the aforementioned book in many places very narrowly composed, although very deeply in the spiritual meaning. And it is so ordered just as God himself dictated to Moses, and we dare not write any more in England than that Latin has, nor to change the order, except solely when Latin and English do not have one means of ordering speech. Whenever someone translates or interprets Latin into English, one should always arrange it so that the English has one’s own manner, or else it is very erroneous to read, for one who does not know the manner of Latin. It is also to be known that some were erroneous, who would cast off the old law, and some would have the old and cast off the new, just as the Jews do. But Christ himself and his apostles taught us to keep both, the old spiritually and the new truly with works. God shaped us with two eyes and two ears, two nostrils and two cheeks, two hands and two feet, and he also desired to have two testaments established in this world, the old and the new, because he does just as he desires. And has no advisor, nor any person need to say to him, “Why do you do as you do?” We should turn our wills to his laws and we may not turn his laws to our desires. I say now that I dare not, nor do I desire, to translate any book after this from Latin into English. And I ask you, dear ealdorman, that you no longer ask this, in case I might be disobedient to you, or false if I do [translate more]. May God be gracious to you ever for eternity. I ask now in the name of God, if anyone desires to copy this book, that he corrects it well by the exemplar, because I have no control if someone brings it to error through lesser scribes, and it is then his peril, not mine. The bad scribe does much evil if he will not correct his errors. Thanks for this, Brandon! It’s very useful. Is this the preface which can be found at the beginning of the Old English Hexateuch (Cotton Claudius B. iv) or is this another preface entirely? Yes, this is the preface appended to three versions of the so-called Old English Hexateuch: London, British Library, Cotton Claudius B.iv; Oxford, Bodleian Library, Laud Misc. 509; and Cambridge, University Library, Ii.1.33. I wonder about a word that you translated: “gate hær”. I would think that is goat hair. Later it is connected to repentance. 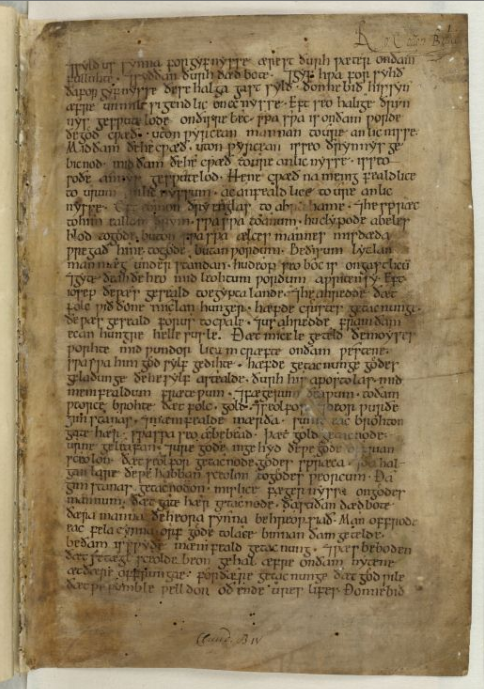 Ah, yes, I just looked back at the original, and you’re definitely right: it’s gatehær in Marsden’s text. I think, for some reason, I conflated this with the previous phrase (“menigfælde mærþa”), and missed the detail. It’s certainly significant that it’s linked to penance, since that tells us a lot about cultural practices; there’s similar imagery, for example, in penitentials. Thanks to your comment, I’ll emend the translation. Thanks, yours seems to be the only available translation of this interesting text introducing the Hexateuch. We should have an online interactive edition of that incredible manuscript. There may have been something from Florida State. Does anybody know of any other publications? If you mean the version in London, BL, Cotton Claudius B.iv (just one of the surviving Heptateuch manuscripts with the Preface, although it’s incomplete at the beginning), there is a full digital facsimile of it at the British Library’s Digitised Manuscripts site: http://www.bl.uk/manuscripts/FullDisplay.aspx?ref=Cotton_MS_Claudius_B_IV. As for more bibliography (on all of the Heptateuch manuscripts), the obvious catalogue is Helmut Gneuss and Michael Lapidge, Anglo-Saxon Manuscripts: A Bibliographical Handlist of Manuscripts and Manuscript Fragments Written or Owned in England up to 1100 (Toronto, 2014); and I would highly recommend the full descriptions, with further bibliography, online at The Production and Use of English Manuscripts 1060 to 1220: https://www.le.ac.uk/english/em1060to1220/.